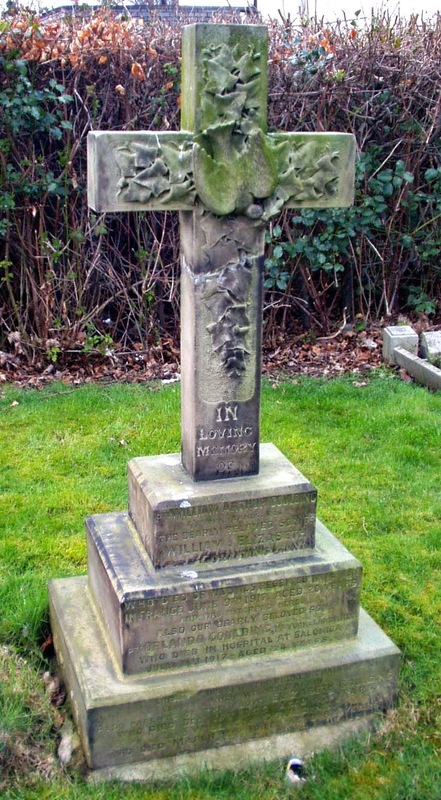 Note that this gravestone commemorates two soldiers, William Arthur Goulding and his brother Orlando. As William is buried in this grave in Cudworth this gravestone is not a war memorial for him, but it is a war memorial for Orlando who lies in Sarigol Military Cemetery in Kriston, Greece. In / loving / Memory / of / Pte. 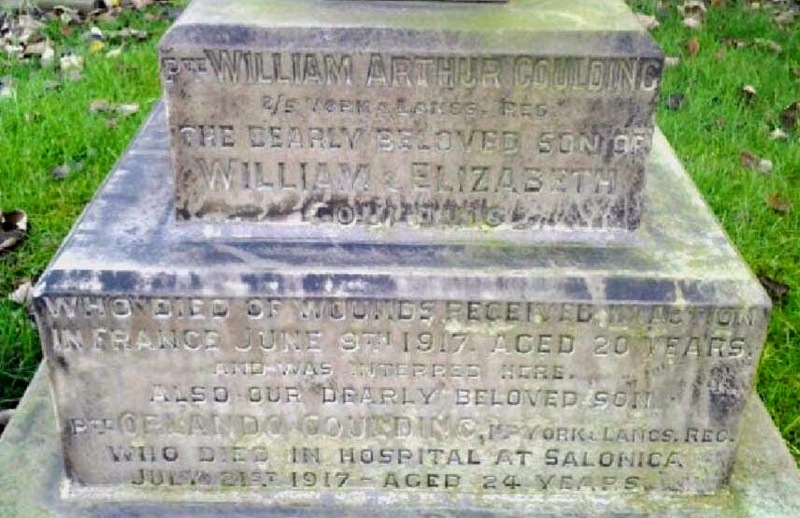 William Arthur Goulding / 2/5 York & Lancs Reg. / the dearly beloved son of / William & Elizabeth / Goulding / who died of wounds received in action / in France June 9th 1917, aged 20 years / and was interred here. / also our dearly beloved son / Pte. Orlando Goulding, 1st York & Lancs Reg. who died in hospital at Salonica / July 21st 1917 - aged 24 years. / They will link the broken chain / closer, when we meet again / also parents of the above Elizabeth Goulding / who died Dec 15th 1945 aged 63 years / and William Goulding / who died March 2nd 1946 aged 82 years. R.I.P. Orlando and William are also remembered on the Cudworth War Memorial. The Cudworth Local History and Heritage Group's book, Lest Cudworth Forgets, includes more information on both brothers. My great grandmother Elizabeth Goulding died at the grand old age of 83 and not 63 as stated. Thank you for this correction. We took our transcriptions from the Barnsley Family History Society Monumental Inscriptions which are available online and on a CD from them and I can only apologise for not checking myself.